If you want to simulate a WAN connection (lower bandwidth, add delay, jitter, etc.) then WANem is a solution that is (relatively) easy to use and free. Configuring the WAN emulator is done via a webpage, but unfortunately there are no API’s exposed to automate the configuration. Since I needed to automate the configuration of the WAN emulator I wrote a PowerShell script. You can find the PowerShell scrip below. 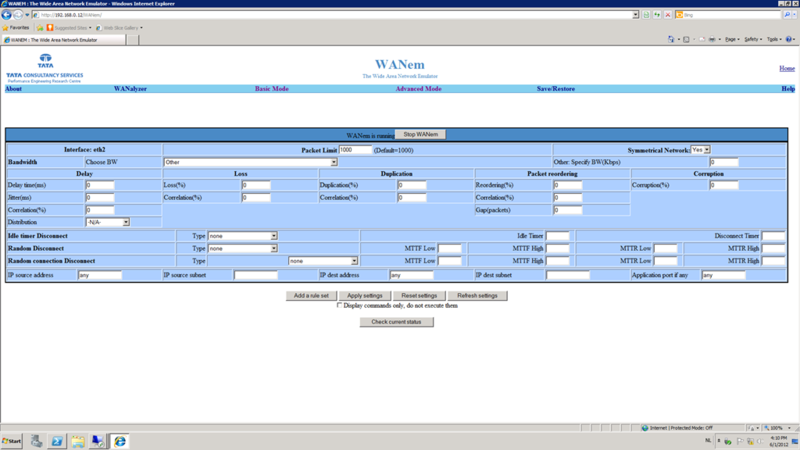 All items that are configurable in the advanced configuration page of WANem are available as a parameter. The parameters that are shown in a dropbown box, like the bandwidth preset, are presented as an enumerable type. WYSIWYG. Ingmar, thank you for sharing this. I’m using it to write a robocopy benchmarking test with WANem. I’ll publish my script once I’ve cleaned it up and will link back to this page.